It has been hypothesized that they also exist to ‘prune’ and thus optimize synapses in the course of normal brain development. A novel study by an EMBL group in Italy has implemented interesting new imaging techniques to confirm this theory, and to show this property of microglia in action. These findings confirm that microglia selectively remove some neuronal connections in the hippocampus while retaining others. This confirms that microglia do indeed perform this synaptic ‘husbandry’ in this brain region, at least. Microglia are part of the brain’s ‘ecosystem’, which is made up of many cell types besides actual ‘nerve cells’. Their study has found that they are most likely present to support and maintain other cell types, like neurons. They are thought to ‘clean up’ debris and other by-products of cell death that would pose a risk to the living neurons in the vicinity. Microglia are closely related to the macrophages that perform similar immunological functions found in other parts of the body. Like macrophages, microglia engulf and break down their targets in order to carry out this type of work in a process called phagocytosis (a term that conveys the literal meaning of ‘cellular eating’). Doing so enables them to remove objects that microglia perceive as unnecessary, undesirable or damaging to their environment. These observations have led some scientists to speculate that microglia may also turn their phagocytotic abilities directly on neurons. However, this is not done in order to harm the cell, but rather to remove anomalous or superfluous connections or synapses. 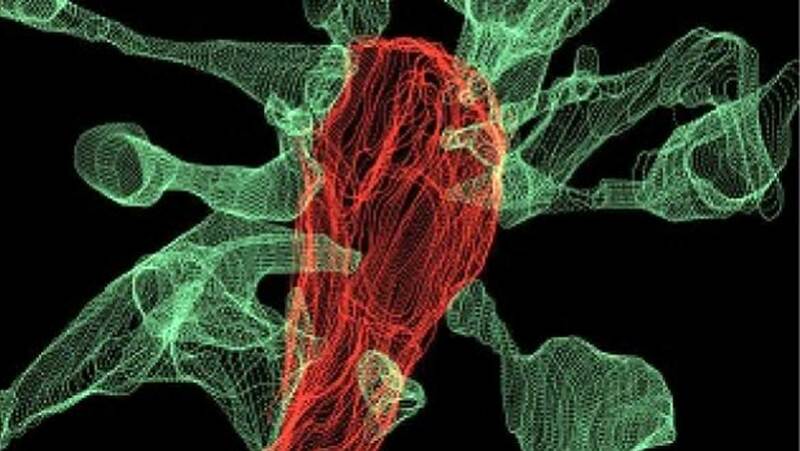 Synapses form at interfaces between one neuron and another and is the essential basis for all nervous-system functions. A neuron may have one synapse with one other or maintain numerous synapses between many other cells. The inability to regulate synaptic formations during brain development may lead to all kinds of neurological problems, from movement disorders to memory loss. It appears that some microglia may exist to pick and choose which synapses to keep and which to destroy. However, this theory has been based on indirect evidence and some older imaging studies. No scientist had actually witnessed microglia enacting phagocytosis on a living neuron. On the other hand, microglia had been seen to be active in normal brain tissue; some of which may have been taking the ‘positions’ and forms necessary for phagocytosis in the absence of damaged cells or potentially dangerous material. Therefore, it was reasonable for the researchers in question to hypothesize that microglia were active and carrying out some kind of process for the benefit of normal healthy brain tissue. In addition, some microglia in the growing brain also change and mature in sync with growing, maturing synapses. They also express biochemical receptors for proteins (known as signaling factors) that are also associated with those for neuronal development and function. In addition, mice engineered to be deficient in important signaling factors that apply to microglia (e.g. those associated with the ‘fractalalkine’ signaling system) exhibit excessive immature synapses in more recent studies. The researchers behind this study also concluded that microglia engulfed at least some synaptic matter. Therefore, a team of scientists from the European Molecular Biology Laboratory (EMBL) in Rome set up a new experiment with enhanced imaging technology in order to capture microglial activity in an isolated section of living hippocampal tissue. This technique, known as correlative light and electron microscopy (or cLEM), showed that microglia did in fact carry out a very specific and selective form of phagocytosis known as trogocytosis. Taken from the Latin word for ‘nibble’, trogocytosis is a more focused, ‘surgical’ type of engulfment that removes part of another cell’s membrane without killing it. Given that a synapse is a highly specialized form of membrane, it makes sense that a microglial cell would perform trogocytosis in order to guide its maturation. The team, led by Laetitia Weinhard from the Gross research division at EMBL Rome, initially used conventional quantitative confocal microscopy to image the microglia and the synapses they were in contact with. This technique did not result in the detection of overt phagocytosis; therefore, the researchers moved on to cLEM to confirm this. Through this medium, they observed that the microglia ‘nibbled’ at the synapses in the course of their maturation. The scientists also reported that microglial cells also served as a kind of nexus point between multiple synapses, so that they could perform their trogocytosis more efficiently. The form of cLEM used in this study was powered by focused ion beam scanning electron microscopy (FIB-SEM) and also capable of supporting images of microglia and their associated dendritic spines (the ‘ends’ of excitatory hippocampal neurons where synapses are located) highlighted in different colors. These were facilitated by using fluorescent markers in red for the microglia and green for the dendrites. This application of cLEM resulted in high-resolution images of both cell types at scales of 5 to 0.5. micrometers (µm). The data captured also resulted in 3D models of the microglia/dendrite interfaces of about 560 µm3 in size. The images also enabled the researchers to conclude that the microglia also induced the dendritic interfaces to form further ‘micro-spines’ in order to present synaptic portions in need of removal. These features, known as filopodia, had also been observed in prior studies that connected them with contributions to novel synaptic formations. Alternatively, filopodia have been seen to function when a dendritic spine needs to transfer from one bouton (a similar micro-extension that could belong to a microglial cell or another neuron) to another. This processing is a part of synaptic re-modelling and is thus more potential evidence that microglia are involved in synaptic maturation. This imaging study offers the strongest evidence yet that microglia function to facilitate proper synapse formation in the developing brain, in addition to being a ‘cleanup crew’ in the event of brain cell death. It has also provided a new instance of trogocytosis in the body, which is a recently-discovered variation on phagocytosis that can ‘prune’ cells without harming them. The researchers behind these findings, who also published their findings in a recent issue of Nature Communications, propose future work in which the mechanisms of trogocytosis are studied in more detail. For example, they hypothesize that some membrane components may have virtual, biological “nibble here” signs pinned to them. Such research may also elicit potential implications for trogocytosis and its failure (e.g. through microglial disorders) for the future of medicine. Weinhard L, di Bartolomei G, Bolasco G, Machado P, Schieber NL, Neniskyte U, et al. Microglia remodel synapses by presynaptic trogocytosis and spine head filopodia induction. Nature Communications. 2018;9(1):1228. Paolicelli RC, Bolasco G, Pagani F, Maggi L, Scianni M, Panzanelli P, et al. Synaptic pruning by microglia is necessary for normal brain development. Science (New York, NY). 2011;333(6048):1456-8.